Swedish Sea Squalls: Atterberg's 3rd "West Coast Pictures"
Kurt Atterberg's Third Symphony, "Västkustbilder" (West Coast Pictures), stands out among the esoterica as a particularly unrestrained portrait of maritime scenes, and the Rasilainen conducted CPO recording does it full justice. Atterberg is the latest of Sweden's ample share of late Romantics (a little less than a generation younger than predecessors Peterson-Berger, Aflvén, and Stenhammar), composing music of swelling grandiosity well into the 1950s. Atterberg wrote nine symphonies in all (and #9 is choral, naturally), uneven in seriousness but consistently pleasurable and well-wrought. From the rare person who's heard all nine, the Third is frequently ranked as his finest foray into the genre. Indeed, Atterberg's compositional predilections -- loose forms, shades of Swedish folk music, sweeping melodies, and eager tone-painting -- meet in happy confluence in this oceanic essay. 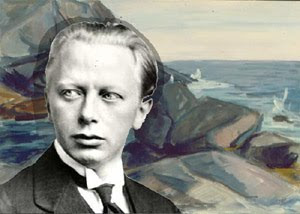 Likely inspired by the scenery of Stockevik, a tiny town on the west shore of the island Skaftolandet, the symphony was written over the course of three years and completed in 1916. Like some other famous symphonies whose outward projection of unity belies a more cobbled compositional process (cough Berlioz), Atterberg's Third emerged from what was conceived of as a group of standalone tone poems concerning impressions of the sea. A fleeting hint of cyclical recall of the first movement's opening in the subsequent two does manage to pay lip-service to overall cohesion, but the logic across (and within) movements is clearly pictorial and cumulative rather than strictly "symphonic." Critics seemed enthused regardless, a German reviewer praising "West Coast Pictures" as "perhaps the best that has been composed up until now apart from Richard Strauss's orchestral works." From their sibilant titles, each of the three movements is meant to evoke a different nautical scene, "Sun Smoke," "Storm," and "Summer Night." The "Sun Smoke" portrait features the gentle undulations of a modal figure (the scantily recurring cyclic motif) that steers the orchestra through tranquil waters. I hear glimmers of Debussy, and pre-glimmers of Puccini's Il Tabarro in this opening. The requisite "Storm" that follows is surprisingly tuneful for an orchestral gale, a battery of sturm+drang topics stitched onto generally four-square melodies. Despite its pictorial aptness (there is no shortage of wave-crashes! ), I find this storm the symphony's relative weak link -- Atterberg's melodic tendencies get slightly in the way here, depriving the movement of the potential ferocity that his orchestrational imagination might have been otherwise capable of. (You have to wait to his wonderfully strange Ninth to hear Atterberg really synthesize his tuneful and destructive sides -- for a rendering of Ragnarök, appropriately!). Atterberg's Third turns out to be one of those symphonies that saves its best for the end, and then heaps it on in generous proportions. The "Summer Night" is the work's end-weighted glory, a movement as long as the first two combined and containing the most compelling material. It blithely forgets the tensions of preceding tempest; Atterberg's description of the movement implies that for the rest of the symphony, we've sailed into untroubled seas, a vision of the "peculiar peace of the inner fjord, while the sea roars outside but its raging can hardly be heard." The 18 minutes of "Summer Night" consist of a succession of episodes, alternatively placid and ecstatic, in a extremely loose rondo form. A few minutes in comes what I feel to be the symphony's most impressive section, a theme of an albatross-like wingspan. This type of long-breathed melody soaring above an active but contrapuntally simple accompaniment is, for those who like their classical music juicy and romantic, one of Atterberg's most attractive specialties. More melodic episodes drift in and out. A brief scherzo is embedded within the center of the movement (a strategy employed in his Second Symphony as well), serving to introduce a turn motif that figures into the coda, as well as picking up the tempo for the more blustery restatement of the albatross theme (it's undoubtedly high-tide now!). Moving into "Summer Night's" final pages, Atterberg deems even the gracious albatross theme too dark, building up the pieces of a broad new subject that will dominate the score's elated coda. The sounding of all bells, whistles, and fanfares at conclusion leaves a taste of almost Tchaikovskian triumphalism behind -- though by this point, you're either so swept up by Atterberg's swooning extroversion, or have long since stopped listening, to be bothered by such relinquishment of symphonic decorum. Yeah, that storm theme is more like a character going through a storm than a depiction of an actual storm. I do like the Disney harp-and-bell effect in the "Sun Smoke" excerpt. "This type of long-breathed melody soaring above an active but contrapuntally simple accompaniment is, for those who like their classical music juicy and romantic, one of Atterberg's most attractive specialties." As a big fan of Atterberg and this symphony in particular, sending this link around remote e-friends is now my preferred way of infecting them too! Thank you for a beautifully presented and well-written blog. When are you going to take a look at the great Havergal Brian? Thanks David for the kind words, and for helping spread the blog. At some point I'd certainly like to write up another Atterberg symphony (probably the 9th, though I don't want to risk overdoing the Nordic myth/legend angle I seem to be prone to!). As for Brian, well he's certainly on our radar although and you should stay tuned!